hazmy I used a Canon 400D with a Canon 90 - 300mm lens and I was stood on the pier the exif data is ISO 100 F5.6 @ 1/500 Seconds. Hurrah for another 400D user..
but the timing is spectaqular.. congrats.. Fantastic shot! Any reason why the water at the base of the curl is showing up red? Makes me think of blood for some reason. Jason its the sand washing up with the waves. 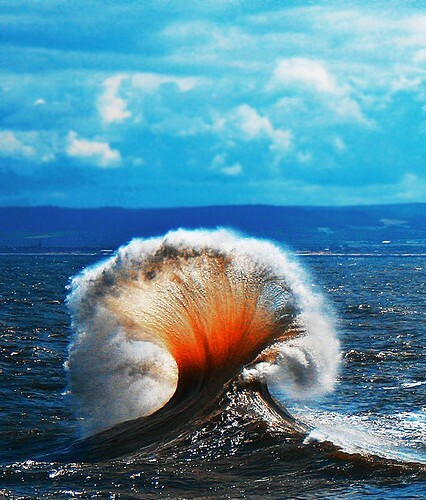 The only thing I can think why its so red is from the sun shining through the wave. Has to be the most impressive shot I have seen in a long long while. oakey no saturation all in camera. I think it was two waves crashing over the rocks one from one direction and one from the other. I think I'm the only one who hopes for bad weather so I can catch the waves. Great shot, just hope you kept your camera dry while taking that one. Thanks Calicajun I managed to keep dry.